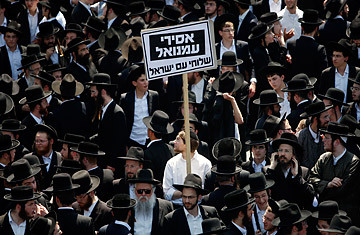 Israel's domestic culture war between religious communities and the secular courts took to the streets on Thursday as tens of thousands of ultra-Orthodox Ashkenazi (European) Jews paralyzed the streets of Jerusalem and the Tel Aviv suburb of Bnei Brak in a protest march. The target of their outrage was the imprisonment of 43 couples for refusing to allow their daughters to attend a religious school where they would have to mix with the daughters of religious Mizrahi Jews (a term sometimes conflated with Sephardi and referring to those who hail mainly from the Arab world). Dressed in their Sabbath finery of tall fur hats and delicately embroidered long black silk coats, men bound for prison were carried shoulder high by a dancing, singing throng through the streets of Jerusalem to the city's Russian Compound police headquarters. Some wore a red sash emblazoned with the legend "Holiness for the sake of heaven." "We are going with gladness in our hearts," said Rabbi Eliyahu Biton as he walked toward jail, although 22 of the convicted women and four of the men failed to appear. The parents at the center of Thursday's drama, followers of Rabbi Shmuel Berzovsky who leads the tiny Slonimer Hasidic sect, chose two weeks in jail rather than sending their daughters to the Beis Yaakov school near their homes in the religious West Bank settlement of Emanuel. Their reason? At the school, the Ashkenazi kids would mingle with religious Mizrahi kids, some of whom come from more secular extended families and therefore, say the Slonimers, could expose their sheltered daughters to unwanted influences from the wider world. And their imprisonment was the culmination of a two-year battle between the ultra-Orthodox sect, which effectively controls the school, and Israel's secular Supreme Court. Before the Beis Yaakov controversy, few people had heard of the Slonimer, named for the town in Belarus where their first rabbi lived 200 years ago, and the sect's internal power struggle between rival leaders in Jerusalem and Bnei Brak. But the fight over the schoolgirls has united the tiny group and transformed it into the latest torchbearers of a festering feud between the ultra-Orthodox and the secular establishment. Thursday's demonstration was the largest in Jerusalem since ultra-Orthodox protesters gathered in similar numbers in 1999 in a show of strength against the supposed antireligious bias of Israel's Supreme Court. A decade on, the gap between the two entities is wider than ever, with running debates over such issues as the power of religious courts, state subsidies for religious students, religious exemption from military service and access to public roads on the Sabbath. In August 2009, the Supreme Court ruled that a separate stream created in Beis Yaakov school two years ago for the Slonim amounted to "rampant discrimination" against the rest of the pupils, who are 95% Mizrahi. The court ordered the school, which is financed by the state, to remove the physical barriers and integrate the classes. For six months, the parents defied the court. When the barriers finally came down, 43 families removed their daughters and then sent them to another state-funded school in Bnei Brak, an hour's drive away. But parents are not allowed to move their kids from one school to another in the middle of a school year without permission from the education authorities, and their departure left the Beis Yaakov school with too few kids to be viable. On Tuesday, the Supreme Court ruled that the parents must return their daughters to the now desegregated school by Thursday or report to jail. The open defiance of the parents led opposition leader Tzipi Livni to wonder aloud about the future of the rule of law in Israel and the deafening silence of government ministers scared of offending ultra-Orthodox parties that hold the balance of power. "I have heard that there is a group of people who have said ahead of time that they refuse to accept a Supreme Court decision," Livni told supporters this week. "There is no room for such declarations in a democratic state. I am not a fan of the Supreme Court's involvement in all issues, but when the political and state leadership does not accept decisions based on the values of the state of Israel, the Supreme Court has no choice." Aviad Hacohen, the lawyer who filed the Supreme Court petition on behalf of Yoav Lalum, chairman of the Noar Kahalacha association, which battles ethnic discrimination in religious schools, tells TIME that the Slonimer refusal to have their kids attend school with the Mizrahi girls has resulted in the school excluding dozens of Mizrahi girls since last fall. And, he warns, the problem in Emanuel is the tip of an ultra-Orthodox iceberg threatening to sink the rule of law in Israel. "This can lead to real anarchy," says Hacohen. "I hope the rule of law will prevail, otherwise it won't stop with the ultra-Orthodox and others will do the same. I wish I could tell you the law will win, but I'm not sure."